A college student resume is a great tool to help with college admissions, letters of recommendation, scholarships and grants, and student jobs. It is your opportunity to shine and stand out against the competition. A good college student resume is a key tool to get accepted at top colleges and universities with a great financial aid package. Why Create a College Student Resume? College Admissions - Some colleges and universities request a resume, or will accept a resume along with your college application or portfolio. A well written resume allows you to highlight your accomplishments and qualifications that make you a uniquely qualified candidate for admission to the school. Letter of Recommendation - Many teachers and community leaders are asked to write letters of recommendation for many students. Even if they know you quite well, they do not know you as well as you do. When you ask them to write a letter of recommendation for you, provide them a well written resume that they may refer to as they write that outstanding letter of recommendation. Scholarships and Grants - A great college student resume can show how you are the best student to receive that scholarship money for college. Student Jobs - If you are looking for a student job or summer job, you should have both a personal business card and resume to provide your potential employer. Contact Information - Include your name and one phone number and email address where you can be reached. Include your address if it is to your advantage, e.g. to show you live locally. Important tip: make sure your email address sounds professional, and your answering message on your phone is professional. Brief Summary - Include a brief interesting summary about you that relates to the purpose of the resume. The person reading your resume is most likely very busy, and won't read past this point if you don't capture their interest. Education - Include relevant courses, seminars, and projects that relate to your major or job interest. Experience - Include paid jobs, volunteer jobs, internships, part-time temporary assignments, school leadership positions that gave you experience organizing, leading, or accomplishing work. Accomplishments - List your top accomplishments, including awards, recognition, and personal accomplishments that show you are the best. Consider Your Audience - Think about your audience before you decide what to include on your resume. Most people reviewing your resume will be older and more conservative than you. Multiple Versions - You will need different versions of your resume for different purposes. For example, a resume for a blogging scholarship may have different accomplishments listed than a resume looking for a summer job at an engineering firm. Organize Your Resumes - Organize and keep track of your different resumes, and keep them up-to-date so you can use them quickly when needed, with just a few tweaks. Don't wait until the last minute to write one, and don't try a one-size-fits-all resume. Other Media - In addition to a written resume, you might want to use other media to present your resume, or to link to from your resume. A Silicon Valley startup might be interested in your YouTube video on flash animation. An art scholarship committee might want to see an electronic album of your portfolio. 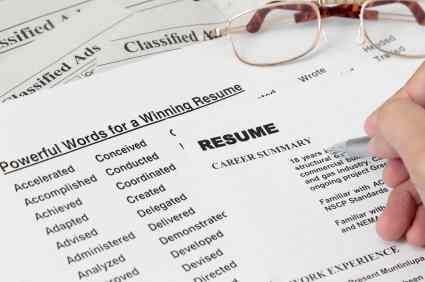 Quick Fix Resume Tips - Ready Myrna's tips for creating a great cover letter and resume.